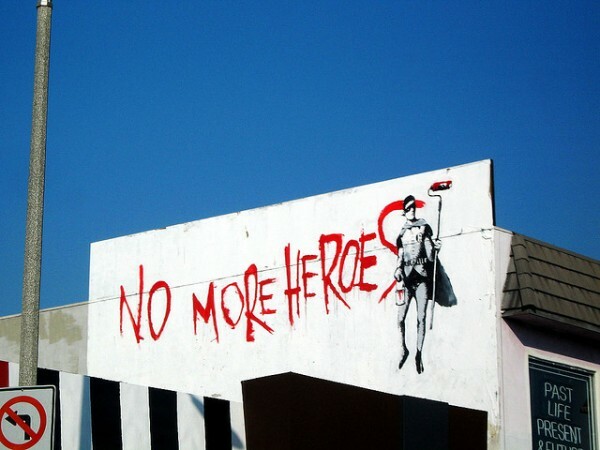 Can Banksy die? I’ve got no doubt that the man who was writing the name Banksy on Bristol’s walls in the 1990’s can and will, at some point, die. That’s not what I’m wondering though. Keith Haring has been dead for more than 20 years, but you can still buy new products with his imagery. Similarly, Basquiat’s estate released prints after his death. But those artists had names and faces. Even after their deaths, products can still be made using their images, but there’s not going to be any new imagery. 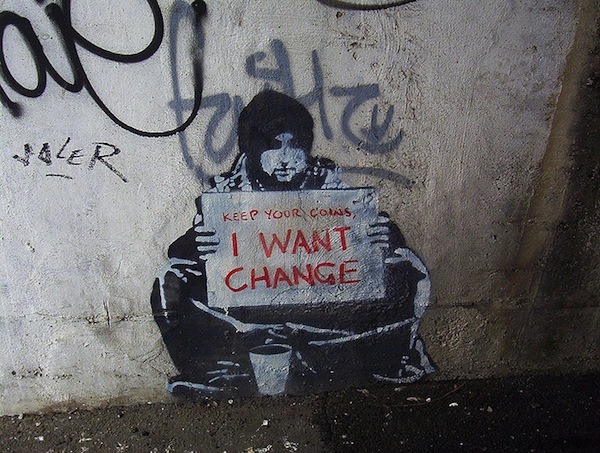 But Banksy (the brand, not the man) doesn’t have those same constraints. Disney didn’t die with Walt Disney. 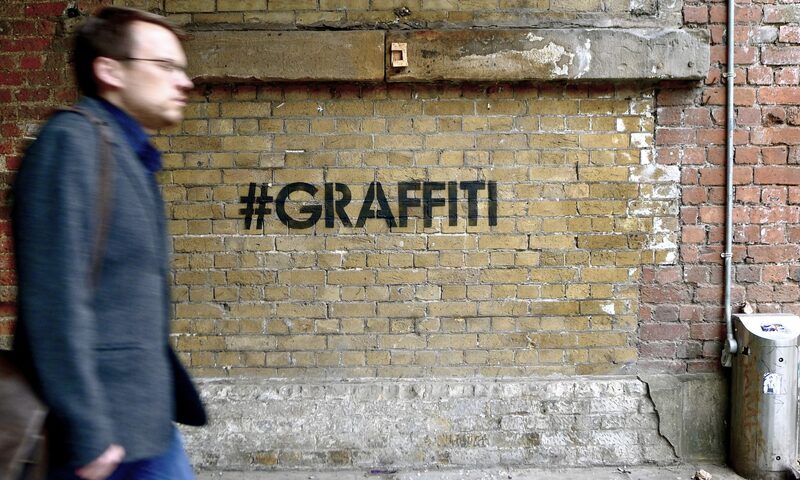 Is Banksy one man or many people? While he is anonymous, Banksy is publicly portrayed as being one person. But what does that one person actually do these days when it comes to making art? What about his indoor work? Maybe Banksy still paints everything himself, but I’m doubtful of that. While hiring assistants might be more difficult for Banksy than Jeff Koons, it’s clear in Exit Through The Gift Shop that Banksy has a staff. At the very least, I think it’s safe to assume that Banksy isn’t executing the creation of any his sculptures himself (no matter what this video purports to show). 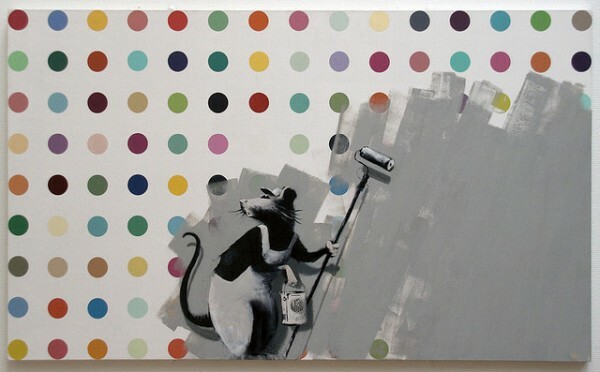 And there’s little reason to think Banksy doesn’t have assistants completing part or all of his paintings. Banksy has said that he paints his own pictures, but how would anyone outside of his team know if he was telling the truth or not? Assistants who work on paintings for an artist are a widely accepted practice. As an extreme example, Damien Hirst has said that his best spot paintings were the ones painted entirely by Rachel Howard, his former assistant. Even if Banksy paints all his own pictures today, it will be difficult, if not impossible, to know if that practice changes in the future. Again though, some use of assistants for painting is probably what almost any artist in Banksy’s position would do. But regardless who who physically executes the artwork, conceptual artists have long contended that the artist is the one who comes up with the idea of the art, not the one who makes the art. By that standard, what makes a Banksy a Banksy is that he came up with the idea, but he isn’t the only one who could do that. Countless artists emulating Banksy, as well as generations of political cartoonists, have shown that coming up with clever 1-liners isn’t a skill possessed only by one man. 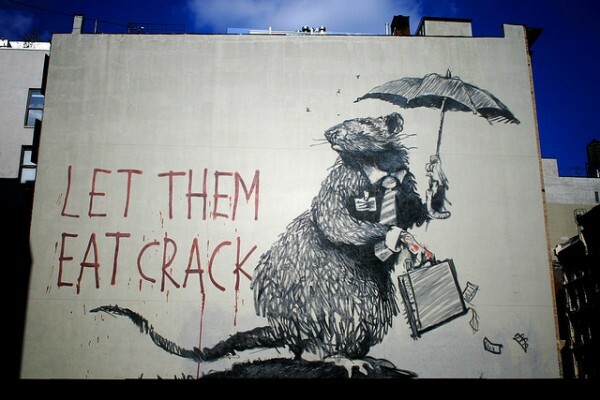 Admittedly, I think most people find Banksy’s average success rate with his jokes to be higher than that of a lot the people he has inspired, but that is probably as much about being careful with what you put out there as it is about being clever. Maybe it’s true that no one person will ever be as good as Banksy at his brand of humor and commentary, but a dozen people working together probably could be. But I’ve already made an assumption here: Today, there is only one individual who comes up with all the ideas behind Banksy’s artwork. Again, we have no way of knowing how true that assumption is. Banksy’s cloak of anonymity means that the public really has no idea how many people contribute ideas to the Banksy identity. Today and in the future, the ideas behind Banksy’s art could come from one man or a team of 50 with no input from the original individual who called himself Banksy. How could we tell the difference? I’m inclined to think that Banksy, the man, is a hard working guy who does involve himself in the making of the artwork that he signs. But given all the possibilities for others to be involved in the Banksy brand without the public knowing a thing, it is clear that the Banksy brand can continue to create artwork indefinitely with or without the original man behind the name. Like the many boys who took on the role Batman’s sidekick Robin (oh, haha okay I came up with this metaphor days ago and only now as I write it down do I realize the irony given Banksy’s supposed identity. I’m an idiot), an anonymous artist’s name and image can be taken up by any number of people. 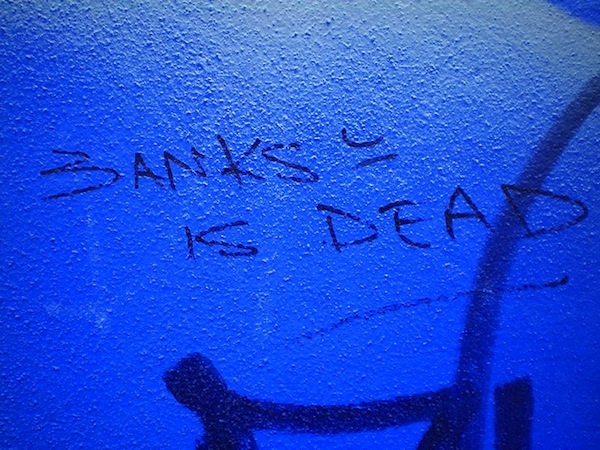 If the man behind Banksy ever leaves the Banksy organization, or when he dies, will the public ever know? It’s possible that my grandchildren will be able to see “original” Banksy artwork completed a century from now. Banksy seems to have reached the absurd hyperbole of conceptual art: the original artist may not even need to conceive the artwork for it to bear his name. Banksy has finally achieved what Warhol and others set out to: the artist is truly a brand without a human identity.